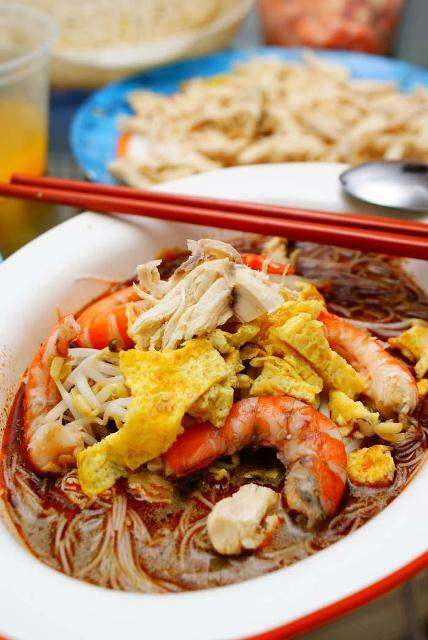 If you love hot and spicy food, then on your next trip to Sarawak, especially to the capital city of Kuching, you must not miss the famous Sarawak Laksa. what food is it actually? Well, it is actually rice vermicelli mixed with prawn or shrimp paste, topped with fried eggs that are cut into thin slices, blanched bean sprouts, steamed soft chicken slices and juicy tender prawns. Once all the ingredients are mixed together with thick Laksa gravy poured over it and ready to be served, you may want to squeeze a little lime over it and garnished with coriander leaves. You may also want to add in some “belachan” (spicy shrimp paste) before you consume it. Belachan is a popular ingredient in South East Asia. It is commonly used in South East Asia and Southern Chinese cuisines as a shrimp paste or shrimp sauce. In Indonesia, belachan is known as terasi, ngapi in Burma, kapi in Thailand and mam tom in Vietnam. A bowl of Sarawak laksa depending on whether it is a large bowl or a small bowl costs around rm4 to rm6 . (rm3.6=usd1). This Laksa is so delicious that after eating it, it may even send you licking the bowl too. You may even order a second bowl thereafter. This dish will definitely warms up your stomach for the whole day. When you are in Kuching, you can easily find Laksa being sold in many coffee shops. However, the well known coffee shops that sent people waiting and queuing up for hours are the coffee shops at Tabuan Laru, another stall at Bormill third mile and in the city centre located beside Grand Continental hotel. My favourite Sarawak Laksa stall is at Foody Goody coffee shop at Tabuan Laru vicinity. I would patiently wait for at least half an hour on Sundays as there were just too many customers waiting for their bowl of Laksa. The Sarawak Laksa is available only on mornings as they would be sold out by lunch time. The best and most delicious Sarawak Laksa in the whole region of Sarawak is still in Kuching city. You should go check it out if you are in Kuching for work, business or leisure.